The GenePix 4400A Scanner acquires data at user-selectable resolutions between 2.5 and 100µm per pixel, allowing optimization of image resolution and file size for each experiment. Both systems are capable of automatically choosing photomultiplier gain value, for fast and easy optimization of signal intensity and channel balance. Up to four internal lasers can be installed in the 4300A and 4400A scanners, enabling compatibility with a wide range of fluorophores. Easy-to-access, sixteen-position filter wheels allow users to add additional emission filters as desired. The 4300A and 4400A scanners expand overall sample compatibility with user-adjustable focus offset and laser power settings. The ability to adjust laser power in 1% increments provides fine control in imaging intensely bright samples or limiting laser exposure to unstable samples. To ensure constant signal output at each pixel, laser power is dynamically monitored and small fluctuations, are automatically corrected. All GenePix systems image the array surface directly, enabling the use of a variety of microarray substrates, even non-transparent ones. The GenePix Scanners’ optical paths are designed specifically for microarrays with ability to collect as much light as possible from the array surface, while rejecting stray light from other sources. 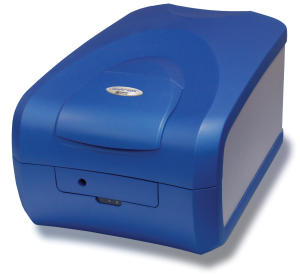 With up to four internal solid-state diode and gas lasers, the GenePix scanner is a remarkably compact bench-top unit. The laser flexibility and choice of up to 12 user-accessible emission filters allows selection of dyes from a broad variety of fluorophores for your assay (CyTM3 and CyTM5 dyes, Fluorescein, GFP, Texas Red, Alexa Fluor® dyes, or quantum dots. With outstanding positional performance and uniformity, the GenePix® 4300 and 4400 Microarray Scanners allow one to perform the most demanding application, like latest generation NimbleGen® arrays or array CGH experiments. Specified and tested for a field uniformity of +/- 2%, these scanners resolve a spatial frequency of 200 line pairs per millimeter (LPPM), and feature a contrast ratio (CTF) of least 50% at the highest resolution.